The sting of Saturday's defeat wasn't any less after a night's sleep, Chiefs coach Andy Reid said Sunday in his season-ending press conference. KANSAS CITY, Mo. 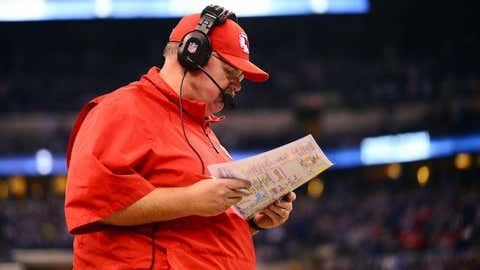 — Chiefs coach Andy Reid talks often about the fine line between winning and losing in the NFL. And on Saturday, that fine line came down to just a few inches. That was the difference between Dwayne Bowe’s right foot being in bounds on the Chiefs’ final play. Bowe’s foot came down out, and the Chiefs turned the ball over on downs, sealing the Colts’ 45-44 win. "Four inches," Reid said at his season-ending press conference Sunday. "We were four inches away from being on the (Colts’) 15-yard line. We had our best receiver on their nickel back. But it was one of the few plays Bowe and quarterback Alex Smith didn’t make Saturday as the offense piled up over 500 yards. But it wasn’t enough, and the Chiefs lost their NFL-record eighth straight playoff game. And they did it in horrifying fashion for Chiefs fans, blowing a 28-point lead in the second half. The sting of that defeat wasn’t any less after a night’s sleep, Reid said. "I talked to the guys this morning and there were a lot of long faces," Reid said. "I can tell you that there wasn’t any joking or laughing going on. These guys had their hearts ripped out. Although the Chiefs completed one of the most amazing turnarounds in NFL history in 2013, going from a 2-14 season to 11-5 and making the playoffs, Reid was finding it hard Sunday to appreciate that achievement. "But the fans came up huge, Clark Hunt came up huge, the players and the coaches all bought into it and changed the mindset. It’s just hard to see that right now. We’re not satisfied." Reid, though, said he tried to emphasize to his players the big picture of getting better each year. We tried some different things. No one is pointing fingers. We’re all in this. We didn’t score enough points. We gave up too many big plays. That’s what happened. "It’s all so final. You put in all that work all season long and then all of a sudden it’s over." The off-season process already has started. "We’re doing our evaluations of the players," he said. "That’s phase one. And then there’s phase two and phase three and then mini-camps and training camps. It comes fast with the calendar." Reid also understands there will be plenty of second-guessing regarding Saturday’s gut-wrenching loss. And there will be plenty of blame directed at the defense, particularly defensive coordinator Bob Sutton, who seemed to avoid blitzing the Colts on Saturday as Indianapolis methodically worked over the Chiefs secondary. "We tried some different things," Reid said. "No one is pointing fingers. We’re all in this. We didn’t score enough points. We gave up too many big plays. That’s what happened." Reid said he did not anticipate any staff changes, though he did acknowledge there would be roster movement. "Every team is different each year," he said. "There will be guys moving on. I told the team that for those who won’t be here, I wish them the best."